Another “historical” birthday inside the Olimpia family. 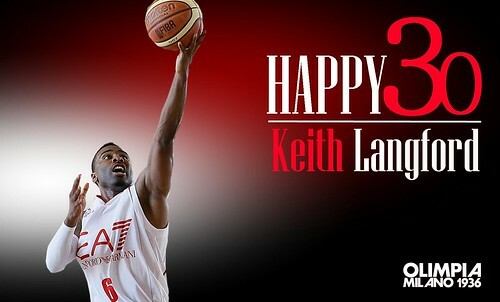 Today, Keith Langford, in his second season in Milano, turns 30. He was born on September 15, 1983 in Fort Worth, Texas. Six days earlier it was David Moss turn to be 30. Langford played four seasons at Kansas playing the NCAA Final Four and being coached by two of the greatest names in the profession, Roy Williams and Bill Self. Then he played professionally in Italy, in Soresina, where Flavio Portaluppi was one of his teammates, then he returned to the States to play briefly with the San Antonio Spurs, then in the D-League as a rising star and finally again in Italy. First in Biella, where Massimo Cancellieri was an assistant coach just like in Milano now, the Virtus Bologna (Eurochallenge’s Mvp), Khimki Moscow, Maccabi Tel Aviv (Adriatic League’s Mvp) and now he’s in Milano. During the preseason he’s been appointed team’s captain while Alessandro Gentile is still away.